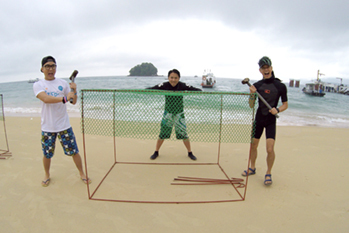 TIOMAN, OCTOBER 2016 – Berjaya Tioman Resort recently held the annual Corporate Social Responsibility (CSR); Tioman Island Clean-Up Day (TICD) to play our parts in restoring the beauty of the sea and natural heritage of Tioman Island. 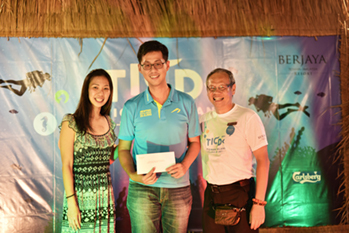 The event took place from 21st until 23rd October 2016 and a total of 112 divers from Singapore and Malaysia participated in TICD to unite together for planet earth in preserving the nature. Representatives from Reef Check, Sharksavers and Jabatan Taman Laut were also present to show their supports toward this event. TICD is an annual CSR event started in the year of 2010 and is continuously supported by PADI Project AWARE and dive centres such as Group 1845, R&D Scuba and Scuba People. Mr Sonny Gan, the General Manager of Berjaya Tioman Resort explains that “the objective of TICD is to raise public awareness on the importance of conserving the island’s marine environment and for this year, we choose the tagline Together for Planet Earth because we believe that TICD unites everyone in one place to give back to mother earth as much as possible”. The audience of TICD comprises of both divers and non-divers, mostly working professionals with middle to high income but are all driven by the same passion: care for sustainable environment. The dive activities along the three-day even include the submerging coral nursery tables, collecting the COT (Crown of Thorns), coral harvesting and coral planting as well as underwater photography. On the second night, the Singapore Dive Operator celebrates the divers by hosting a Gala Dinner and award-giving ceremony was done for the top 5 producing dive operators. The non-divers, on the other hand, were given the chance to do water activities such as snorkeling in Pulau Renggis, Glass Bottom Boat Activity and Kayak. It is a bonus for them as Berjaya Tioman Resort has an 18-hole golf course and they were able to experience the Discover Golf during their stay. In order for the non-divers to contribute to the nature, they did the cleaning up at the land area including the herbs garden, jungle and waterfall area while doing their jungle trekking activity on the second day. Each year, TICD will have one marine icon to be highlighted throughout the event and this year, the icon is the majestic seahorse. To promote environmental awareness from young, we have invited 10 students from Sekolah Kebangsaan Tekek and 20 students from Sekolah Menengah Kebangsaan Tekek to participate in a simple ‘Recycle, Reuse and Rebuild’ Project in which they were building two giant seahorses using recycled plastic bottles. 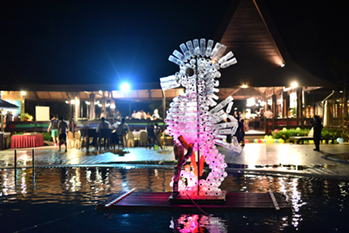 The giant seahorses were displayed during the Gala Dinner as a symbol of annual icon for TICD 2016. All in all, TICD 2016 has reflected the true meaning of togetherness and teamwork. As green consciousness grows, Berjaya Hotels and Resorts continues to identify new ways to enhance environmentally friendly practices and encourage sustainability. Caring for the environment is becoming a vital part of our Legacy of Care and Berjaya is committed to maintain the Tioman Island Clean-Up Day as part of the Corporate Social Responsibility (CSR) to give back to Mother Nature.